Vancouver Canucks' winger Mikael Samuelsson will be out two to three weeks after taking a bump late in the Canucks 5-2 loss to the New York Islanders last night. Samuelsson, the reigning NHL player of the week had been on a tear lately with 10 points in his previous 4 games. 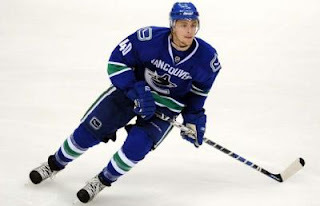 As a result of the injury, the Canucks have recalled Michael Grabner from the Manitoba Moose. TSN reports that Grabner has spent the majority of his time this year with the AHL's Manitoba Moose, where he has 15 goals and 11 assists in 38 games. The 22-year-old also has two goals and three assists in nine games with the Canucks this season. Below is his first NHL goal scored against the Blackhawks as part of a big win early in the season for the Canucks. Glad #40 will be playing again.